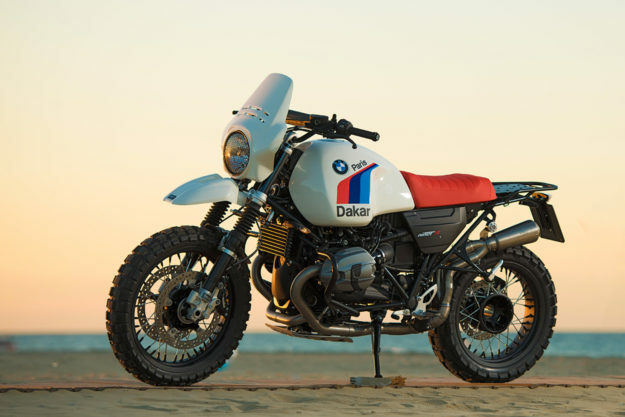 What’s the most iconic BMW motorcycle from the past fifty years? 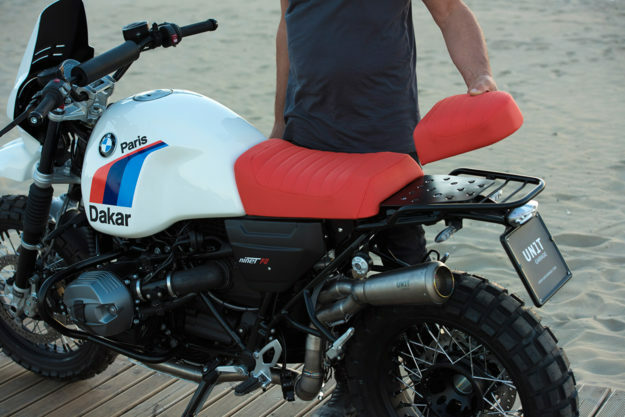 The R80G/S Paris-Dakar would have to be near the top of the list, even if you’re not into ADV bikes. The 32-liter tank, signed by Dakar legend Gaston Rahier and fitted with dual petcocks, has got to be one of the most recognizable tanks of all time. The R80G/S P-D also introduced many people to BMW’s famous motorsport livery. 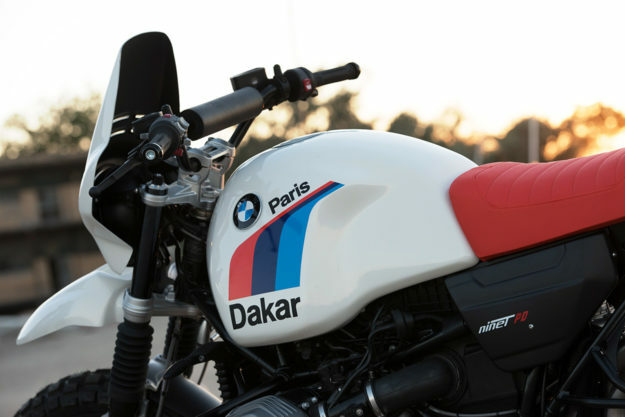 It’s a color scheme that is still being emulated today, from the R nineT Urban G/S we tested a few days ago to the limited edition Les Ateliers Ruby x BMW Motorrad 90th anniversary helmet that sits on my desk. These days, you need luck (and deep pockets) to put a R80 G/S P-D in your garage—only around 3,000 were built. 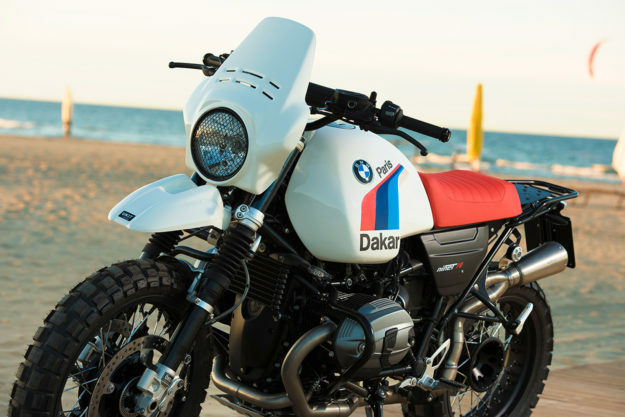 But you can get a big helping of the classic Paris-Dakar style and practicality with a new kit from the Italian specialist Unit Garage, designed to fit the popular R nineT. Unit Garage is run by Fabio Marcaccini, who knows a bit about Paris-Dakar bikes: from 1987 to 1992 he piloted Yamahas in five successive events. “In the early mornings I was waiting in line for the start of the special stages, standing next to BMW pilots like Herbert Schek or Raymond Loizeaux,” Fabio recalls. “I didn’t understand how you could compete with bikes like that—I came from circuit racing. 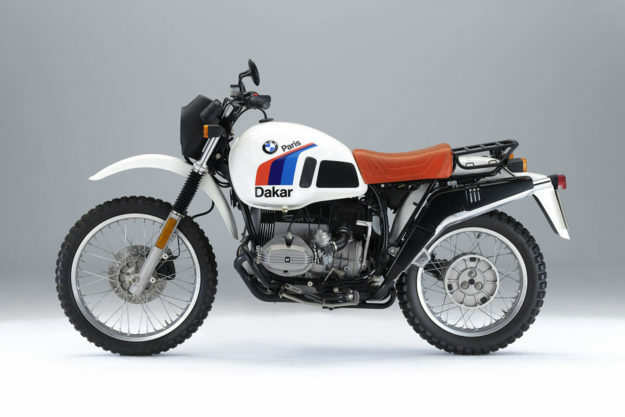 But after finishing with the races, I tried a friend’s BMW R80 G/S Paris-Dakar [above]—and it was just love. It was a simple bike that went slow, but with a charm that immediately made you dream. And so a few months later, I decided to go on a 23,500 km overland trip on board the mythical R80—from Italy to India. 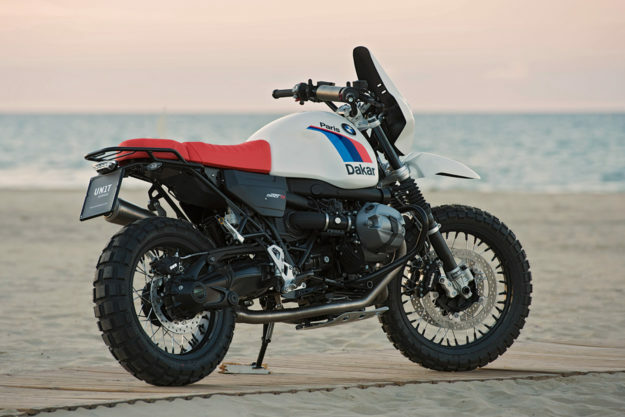 Although the R nineT has been a smash hit for BMW, it’s not designed for long distance travel. So the core of the Unit Garage kit is a new 30-liter tank [Update: Unit Garage has since changed to tank’s size to 22.5 liters], made from plastic and able to accommodate the standard pump, fuel cap and all other internal parts. And it’s very different to the tank fitted to BMW’s own Urban G/S. 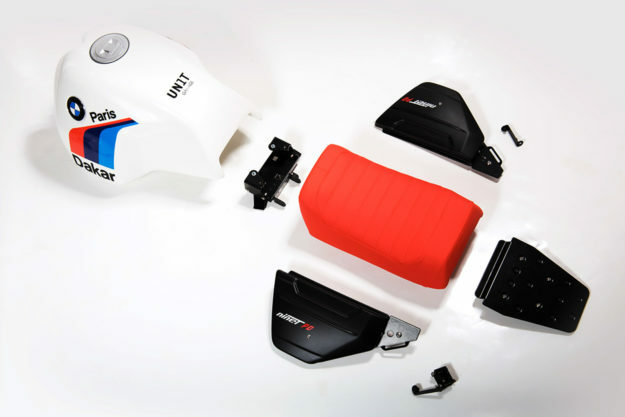 As well as the tank, the Base Kit includes a comfortable single seat, new side panels and a luggage rack. The kit fits all nine T models, but definitely looks better with the 19-inch front wheel of the Scrambler and Urban G/S. The parts can be mounted in a few hours on the standard brackets and attachments, without irreversible modifications. It’s totally bolt-on. 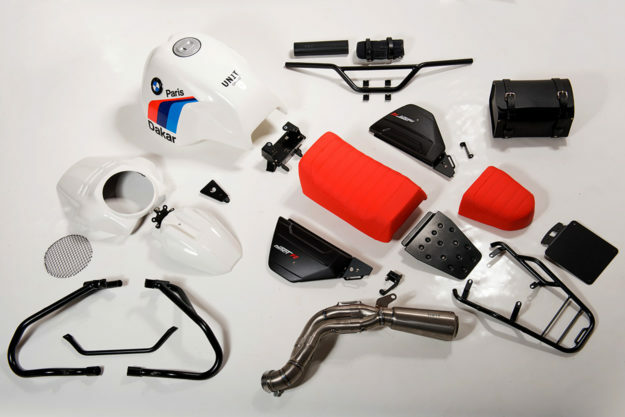 You can supplement the kit with Unit Garage’s own range of bars, exhausts, crash bars, and suspension upgrades. The bike in these images is running Continental TKC80 tires and Unit Garage’s own 1:2:1 High Pipe in titanium (there’s a stainless version available too). The rear shock is an Öhlins, and the forks are fully adjustable Öhlins too. The bars shown here are Unit Garage’s own ‘Ergo’ design, which has a more relaxed inclination while keeping the height of the original. If you want extra height, go for the ‘Comfort’ bend. If you’re planning a big trip, you’ll also need luggage. Unit Garage have bags made from 18 ounce Scottish waxed cotton, waxed suede, or naturally tanned leather from Italy. “It’s solid stuff that ages well, that becomes better with every trip,” says Michiel. If you’re not sold on the angular looks of most modern ADV bikes, but want an air-cooled machine with a proven motor and long distance capability, it looks like Unit Garage have got you covered. The kit will be formally launched later this year at the EICMA show, with pricing confirmed at the same time. 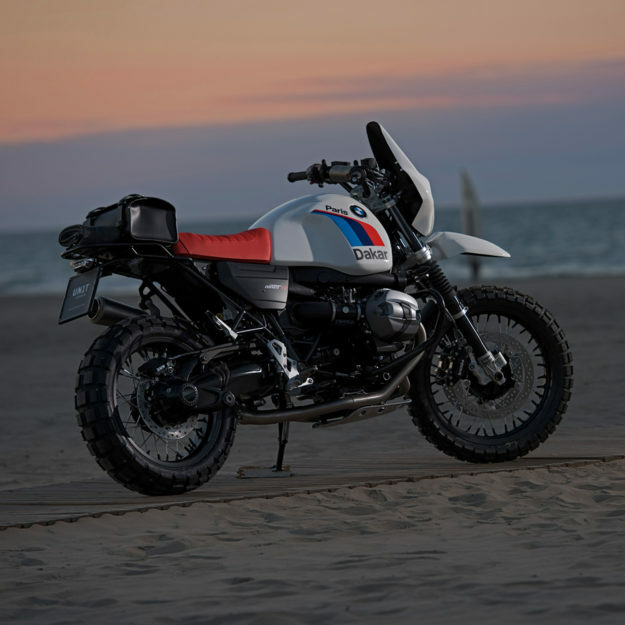 There will be enough fairings, grilles, and racks to turn the R nineT into a practical intercontinental express. It’s giving us an itch to pack some panniers and hit the road. Or, as a German-speaker would say, a serious case of wanderlust.